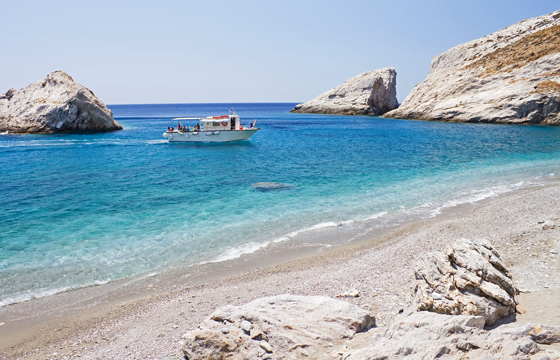 Katergo is one of the most famous beaches of Folegandros due to its crystal emerald waters and its remote location. Offering solitude and serene repose this stunningly beautiful long pebbled beach is ideal for anyone wanting to escape in an oasis of peace and seclusion. The locals used to extract haematite in this area and thus gave the beach the name Katergo meaning galley. Katergo beach is completely non organized and can only be reached by boat or an hour long hiking from Livadi. Visitors should take provisions because no shade or even water is available.